Flying back from Chicago, I watched Playing for the Mob on my iPad. This is the twentieth installment of ESPN's 30 for 30 Vol II. An episode guide for Vol II is here. 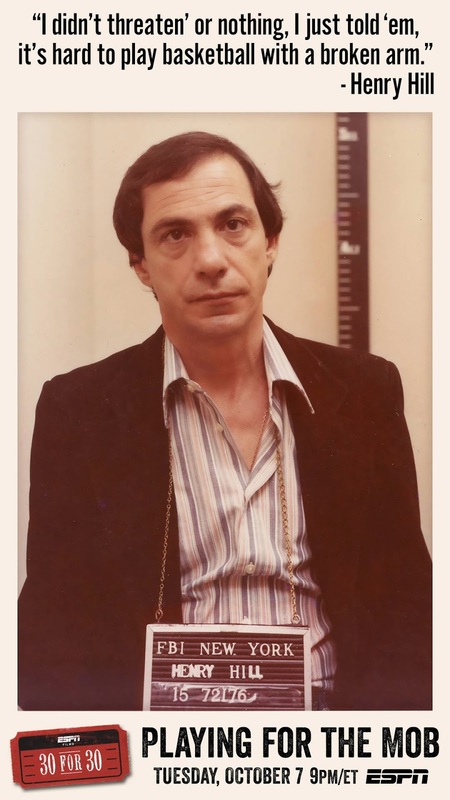 Playing For The Mob is the story of how mobster Henry Hill -- played by Ray Liotta in the 1990 Martin Scorsese classic film Goodfellas -- helped orchestrate the fixing of Boston College basketball games in the 1978-79 season. The film includes interviews with the players, the federal investigators and the actual fixers, including Hill, who died shortly after he was interviewed. Goodfellas was centered on the notorious mobster-turned-rat, Henry Hill. It told about Hill's criminal life and also about members of his "crew" who were involved in the Lufthansa cargo heist at JFK airport, which at the time was the biggest cash robbery in U.S. history. Hill and others pulled off Lufthansa heist at the same time they were working to fix the Boston College basketball games. Playing for the Mob is a solid documentary. They mixed scenes from the Goodfellas movie into the story. This is another of the 30 for 30 stories that I really knew little or nothing about... I need to go back and watch Goodfellas.